Many of you have written to me saying you want to take action, rather than just talk about helping horses, but you feel you live someplace which makes this difficult. Of course my first suggestion is always to educate those around you -- including your government representatives. Some of you insist you want to do fundraising for the horses. Though I rarely make recommendations about places to donate money, I've listed a few places I've donated to and feel I can trust. I'm sure there are many more and as they pop into my mind (or email box!) , I'll share. The websites are full of information and photos and worth visiting even if your support is of the mental rather than financial sort! This group goes to court, Congress, etc., on behalf of the horses and always has up-to-date news on the fight to protect equines -- domesticated and free. I've visited and put in a bit of time helping out here. Lots of you have asked me to teach you how to post book reviews & I'll do that soon. First, though, I'd love to hear from you about where you've read & enjoyed book reviews in the past. I've included a couple places readers visit, below, but please email me your favorites and I'll share with everyone! Present: Isn't this a cool review from Gaited Horse Magazine? It appears in their Winter 2005 issue, released December 10, 2005 and it's in bookstores and on news stands now. 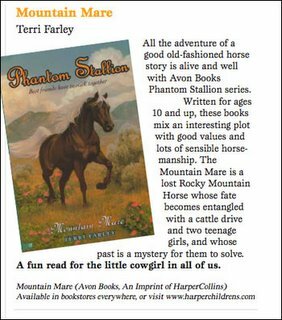 Future: YOUNG RIDER magazine is featuring Mountain Mare in the March/April Bookbag, too. Keep your eyes on their fun website for more details. What do you think? Is the flurry of emails you're sending me, with questions about SEVEN TEARS INTO THE SEA, a midwinter longing for the beach or because Imbolc is coming? Imbolc is a Celtic festival (approximately Jan. 31 - Feb. 2) that celebrates the end of winter and the birth of spring lambs, but maybe you're just all cozied down with books and mine happen to be among them. Whatever it is, I love hearing from you and here are some answers to your questions. What did Jesse mean when he told Gwen that she never called? Can she just go to the sea and cry seven tears and he will come to her? Can she just call to the sea? He seems to think that might work or perhaps he just HOPES it would. According to the legends I've read sometimes it does and sometimes it doesn't! If Gwen goes to sea, to the sea lions, will she find Jesse? No, because male sea lions migrate from Mexico all the way up the coast to Washington! Is a selkie an immortal? Can Jesse turn Gwen into a Selkie? Some people say selkies are fallen angels and that would make them immortal, but legends of the selkies pre-date Christianity, so this may be a slightly more recent addition to the story. My reading of the myth says they're supernatural, but mortal and that Jesse can't turn Gwen into a selkie. Still, some stories say a person drowns and a selkie gives her the breath of life, she (or he) would bond with the selkie clan or become an incredible singer. What would happen to Jesse if Gwen decided to hide his skin? He would be forced to stay ashore and he would be totally miserable, longing for the sea. And if, by some chance, his skin were destroyed -- in a fire, for instance -- he would be stranded ashore forever. If Gwen decided to hide his skin, and Jesse stayd with her for 6 years or 6.5 or really close to the seven years and then she gave him back his skinm would Jesse be able to go back to sea? Yes, but by then he might have grown to hate her. For more answers to FAQs about SEVEN TEARS INTO THE SEA, look at my weblog archives and check out last years September 11 entry. Lots of you have been following the fragile life of My Cheyenne Sweetheart Princess, the orphan filly at the Last Chance Ranch in Oregon, and I have a link to NEW PHOTOS of her. It is truly amazing what love and hard work can do! My favorite photo of her, looking strong, is way down at the bottom of the page -- January 9 #1 . I've told you I hear from book lovers around the world, but how exciting is this? Hi, I’m Sitta from Indonesia, a tropical country stretched in South-East Asia. I just read your latest book, Seven Tears Into The Sea, and it was all captivating book—theme, setting, story, CHARACTERS—to read. I find it sooooo thrilling, romantic,mysterious, and exotic in the same jolt of feeling. How could you possibly create such mood? Since I’m an author in my country, I praise you for this work, and SURELY will wait for your next piece. Next, I learned Indonesian author Sitta Karina had chosen SEVEN TEARS INTO THE SEA as her foreign book of the month! It's been a sad week for wild horses, but you've helped them before and you can help them again. First, a young wild mare, in foal, was shot and died a slow death on a North Carolina beach. Next, BLM revealed it wants to capture half the horses in the Red Rock Canyon herd near Las Vegas. Now the law that slowed horse slaughter in the United States is under attack. The three foreign-owned horse slaughter factories in the United States have submitted a petition saying they want to PAY the U.S. Department of Agriculture so that they can stay open. There is no benefit to having foreign owned slaughter plants in our country. Horses suffer painful, terrified deaths and such a change goes against the will of the American people. The ban on horses slaughter beginning in February this year and ending October 1st of this year won a 269-158 vote in the House of Representatives and 69-28 in the Senate. Ask adults you know what they think about foreign businesses paying to change U.S. laws! As a citizen and voter, I object. Please do NOT accept the petition by foreign owned horse slaughter plants to fund USDA inspectors to allow American factories to continue slaughtering horses. This runs contrary to the will of the American people and the laws of our country. The only motives to support such a move are greed and arrogance. Feel free to use my words. The horses would thank you if they could, but you are their only voice. In October, I relayed readers' requests to be pointed toward PHANTOM STALLION fansites. I've finally had time to find some. PLEASE remember fansites are just that -- written by fans who like (but not always!) an author's work. Authors don't design the sites or pay for them. We just drop in and look around, along with everyone else. Wild Horse Valley http://phantomstallion.org/ has information, trivia, fan fiction and a big collection of foreign PHANTOM covers, AND a strong program to help protect the wild horses. Wild Horse Valley's web master encourages participation and tries to make communication easy. If you're looking for a way to get involved in anything from writing to helping wild horses, this looks like a place to start. If you've ever considered adopting a wild horse, now is a good time to do it. Even if you're only dreaming of hugging your own mustang, visit this website https://www.blm.gov/adoptahorse/ . Once you get there, click on ADOPTION GALLERY to see the amazing horses BLM has up on its Internet adoption site. You can click on each horse to see its story. Many of the horses have been handled & gentled. Some were born in the BLM corrals, so they would be easier to get to know. 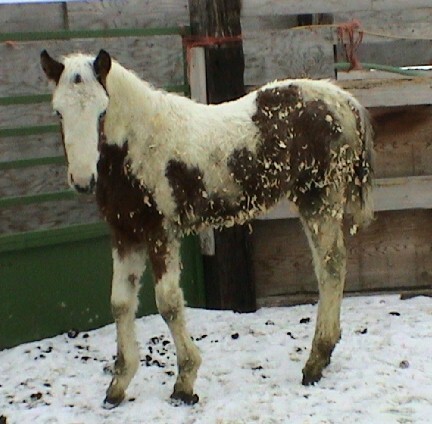 There's a sorrel gelding you'll want for your own...a white mare--beautiful, but muddy...a cremello filly...lots of paints, especially this one yearling stud colt with a gleam of mischeif in his eyes...an amazing red roan...a little bay that seems to fly right out of the photo...um, yes, these horses have a way of making you fall in love with every single one of them! On that same page, you can find the adoption days nearest you, no matter where you live.